Take a walk in the woods during the sometimes chilly month of September. Close your eyes. Breathe deeply. Smell that fungi growing under your feet? Mushroom hunting might be a favorite pastime for some. But for us, finding an equally flavorful olive oil infused with porcini mushrooms works just as well. So we decided to source out the best we could find just in time to satisfy that urge to cook up hearty fare filled with earthy flavors. Our latest addition to the pantry, The Olive Oil Source Porcini Mushroom Natural Flavor Infused Olive Oil, will be a great addition to a chunky stew. Try it on a toasty bruschetta-style appetizer featuring mushrooms instead of tomatoes, or drizzled over a classic Italian wedding soup. 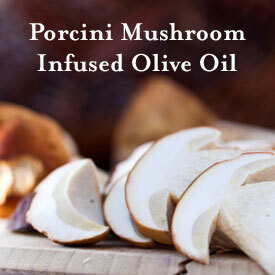 You can find The Olive Oil Source Porcini Mushroom Natural Flavor Infused Olive Oil at The Olive Oil Source Boutique and The Olive Oil Wholesale Store. Is there no end to the flavors we can find in fabulous balsamic vinegars? It appears not. So, this month, we add four new varieties to give your kitchen imagination a kick start. Whether it’s the tangy sweetness of Tangerine or Strawberry Balsamic Vinegars, savory Espresso or mellow Honey Ginger, you can try adding these to dishes from appetizers to desserts. Try adding our Honey Ginger Balsamic Vinegar to a vegetable stir-fry to kick it up a notch, or impress your guests with a mocha ice cream and fresh strawberry parfait topped with shaved dark chocolate and drizzled with Espresso Balsamic Vinegar. You can find these amazing new vinegars at The Olive Oil Source Boutique and The Olive Oil Wholesale Store.